Sports Headphones can inspire you to greater efforts in your daily run or workout, or simply make the commute more tolerable - and with the combination of a design built for comfort, durability and superb sound, plus the convenience of wire-free Bluetooth connection to your phone or personal music player, the AH-C160W is designed to give you the freedom to move with the music. 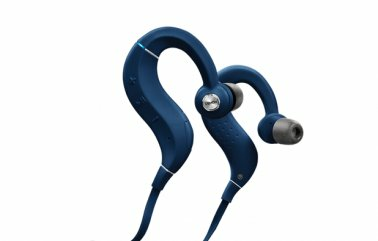 The sleek design of the AH-C160W uses unique Earhook technology, developed with a leading hearing aid specialist, to keep the earpieces in place - even during heavy workouts or when running. Three sizes of ring give the best fit for the ears, ensuring pure music playback and excluding noise. The sound of the Denon AH-C160W has been designed and tuned using advanced digital signal processing - to help and inspire you to achieve your fitness goals faster. The AH-C160W is designed to survive: as well as its durable mechanical structure, even the electronics inside are coated with Nanofics technology, for IPX5/7 class sweat resistance. Let you easily change volume, skip tracks, take calls. So you stay in control of all that performance without reaching for your device. The AH-C160W uses Clear Voice Capture, a sophisticated noise reduction system to deliver the clearest voice quality for phone calls - even in the noisiest environments. Also Multilingual Voice Prompts keep you aware of headphone status - such as battery level - so you can concentrate on getting on with your workout! Along with four sizes of silicon ear tip, the AH-C160W comes with Comply tips made from Memory foam to ensure ultimate comfort in the ear. They're treated with SweatGuard to keep them clean - however hard you exercise! These headphones are a product with a sweat-resistance performance equivalent to IPX7 and IPX5. You can exercise in the rain, touch it with wet hands, and have it exposed to limited water spray. Please do not connect and charge unit if there is water / moisture at the USB connector. Please wipe it off and wait until dry. Do not swim with this product and do not wash it.